In this lesson, we will learn how to solve real-world problems that involve angles of elevation and depression. A building is 8 metres tall. The angle of elevation from the top of the building to the top of a tree is 4 4 ∘ and the angle of depression from the top of the building to the base of the tree is 5 8 ∘ . Find the distance between the base of the building and the base of the tree giving the answer to two decimal places. The height of a lighthouse is 60 meters. The angles of elevation between two boats in the sea and the top of the lighthouse are 2 9 ∘ and 3 9 ∘ , respectively. Given that the two boats and the base of the lighthouse are colinear and that the boats are both on the same side of the lighthouse, find the distance between the two boats giving the answer to the nearest meter. A ladder is leaning against a wall where the upper end is 4.5 m high from the ground. The angle of inclination of the ladder to the ground is 4 1 ∘ . Find the length of the ladder giving the answer to two decimal places. In the given diagram of a ladder leaning against a wall, which of the following angles represents the ladder’s angle of elevation? A man who is 1.7 metres tall is standing in front of a 4.3 metres high lamp post. When the lamp post is turned on the man’s shadow is 2.2 metres long. Find the distance between the man and the base of the lamp post giving the answer to two decimal places. Shady and Yara want to find the height of a statue. Shady stands 5 metres from the base of the statue and measures the angle of elevation, from the ground, to be . Yara stands directly behind Shady, she measures the angle of elevation, from the ground, to be . They both calculate the same height for the statue. How far behind Shady must Yara be standing? Give your solution to two decimal places. Dina and Adel stand at the base of a building on a flat, level ground. They both look up at a television antenna fixed at the top of the building. Dina stands 30 feet from a point at the base of the building and Adel stands 25 feet away from that point. The angle of elevation from the floor where Dina stands to the TV antenna is 6 2 ∘ . Answer the following, giving your solutions to two decimal places. Work out the height of the building. Work out the angle of elevation from the point where Adel stands to the TV antenna. A flag is hung 22 metres up a flagpole. As the flag is raised, the angle of elevation from a point 21 metres away from the base of the flagpole to the flag is 7 4 ∘ . 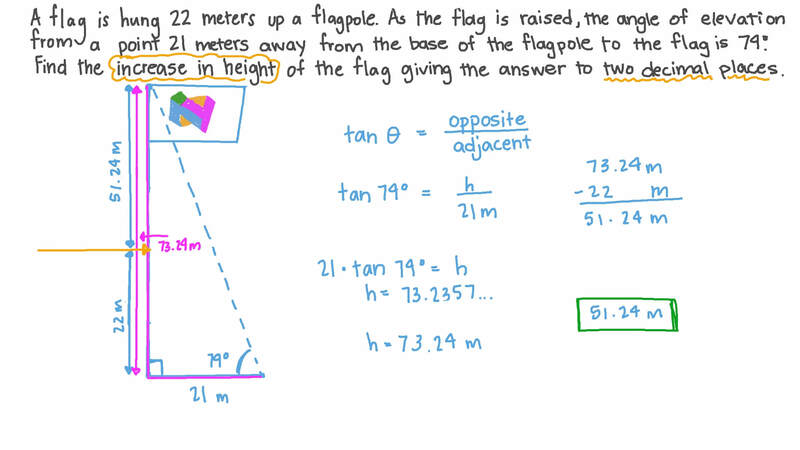 Find the increase in height of the flag giving the answer to two decimal places. If a 20-feet building has a 55-foot shadow, what is the angle of elevation of the top of the building from the tip of the shadow? A ship was approaching a 49-metre-high lighthouse. At point 𝐴 , the angle of elevation to the top of the lighthouse was 0 . 4 4 r a d , and, 12 minutes later, at point 𝐵 , it was 0 . 3 r a d . Find the uniform speed of the ship from 𝐴 to 𝐵 giving the answer in metres per minute to one decimal place. A body’s angle of depression from the top of a tower 77 metres tall is 2 6 3 6 ′ ∘ . Find the distance between the body and the base of the tower given both the body and the tower’s base are located on the same horizontal level. Give the answer to the nearest metre. The angle of elevation to the top of a skyscraper from a 30 m high house is 5 8 4 2 ′ ∘ . The base of the house is 45 metres away from the base of the skyscraper. Find the height of the skyscraper giving the answer to two decimal places. Two points on the ground lie collinearly on either side of a flagpole 29 metres tall. The angles of elevation from the two points to the top of the flagpole are 4 5 1 8 ′ ∘ and 3 4 1 8 ′ ∘ . Find the distance between the two points giving the answer to one decimal place. A man was standing on the ground 28 m away from the base of a tower that had a flagpole on its top. He measured the angles of elevation of the top and the base of the flagpole and found them to be 4 3 3 0 ′ ∘ and 2 2 1 2 ′ ∘ respectively. Find the height of the flagpole, giving the answer to the nearest metre, neglecting the height of the man. A point on the ground lies 129 metres away from the base of a tower. The angle of elevation from the point to the top of the tower is 3 6 ∘ . Find the additional height of the tower needed for the angle of elevation to be 5 7 ∘ from the point. Give the answer to the nearest metre. Two points on the ground lie collinearly on either side of a flagpole 5 metres tall. The angles of elevation from the two points to the top of the flagpole are 3 6 1 8 ′ ∘ and 4 2 3 0 ′ ∘ . Find the distance between the two points in metres, giving the answer correct to one decimal place. Dalia wants to calculate the height of a tree in her garden. She stands at a perpendicular distance of 20 metres from the base of the tree. Using a clinometer, she measures the angle of elevation from the ground to the top of the tree as . Work out the height of the tree. Give your solution to two decimal places.